All reciprocating systems have torsional vibration that is independent of balancing. At torsional resonant frequencies any excitation can result in large amplitudes of vibration. If a resonant frequency lands within the operating range, equipment damage is likely to result from the high vibration. For this reason the best approach is usually to tune the system so that the low-order resonant speed is below the minimum operating speed. 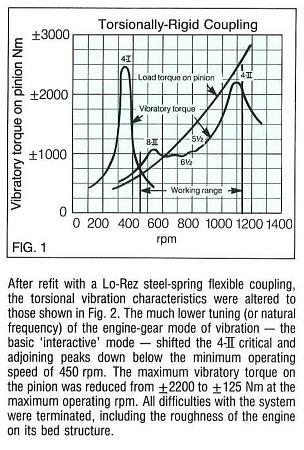 Lo-Rez Steel Spring soft couplings provide a high degree of torsional flexibility between the driving and driven halves of a system, resulting in a low natural frequency, as shown in Fig. 1 and 2. Please, click on the image to expand Fig 1 and 2. 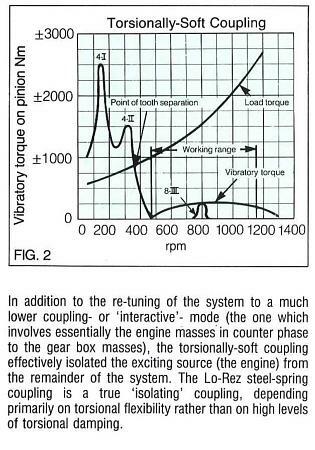 It is necessary to understand the characteristics of a system in order to optimally tune it with the correct coupling. Lo-Rez offers customers the capability of torsional vibration analysis for this purpose. In addition to torsional vibration analyses, solid body dynamics and other vibration capabilities are available in-house. For upgrades to existing systems, Lo-Rez personnel are available for instrumentation work in the field, allowing a correlation of test results with analytical studies.